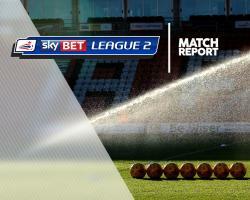 Doncaster extended their lead at the top of Sky Bet League Two to seven points with a 3-0 victory at Yeovil. A first Rovers goal for Mathieu Baudry and a John Marquis double earned the visitors a fifth straight win. Doncaster were always going to be favourites and their captain James Coppinger sent Yeovil a warning message on 24 minutes as he hit the outside of the post from 20 yards. A well-worked free-kick routine caught the home side napping as Conor Grant's cross was swept in by Baudry. By the 35th minute it was 2-0, Matt Butcher at fault as he lost the ball to Coppinger who found Marquis and the striker hit it low past Artur Krysiak. The second for Marquis was a superb individual effort on 80 minutes as he broke from the halfway line and into the box, turning this way and that before finding the bottom corner.